With a coat of paint and a new set of steps, the old Palestine Church is looking sharp. As you can see, Benton County has been taking good care of the old Palestine Church since it was moved to Adair Village in 2010 from its site on Palestine Road in North Albany, where it had sat for more than 100 years. The church dates from about 1882 or 1883 (news accounts differ on the year, sad to say). It was in danger of being torn down for a cemetery expansion in 2010 when the Benton County Board of Commissioners agreed to take it. That summer the building was moved about three miles to a grassy lot near the old Adair Officers Club, where it has become a restoration project for the county’s Natural Areas and Parks Department. 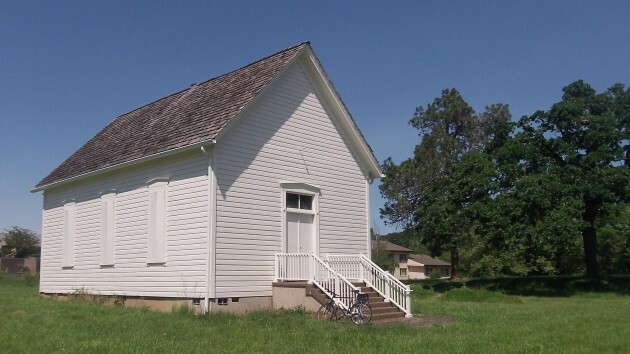 Even though no longer in its original spot, in September 2013 the structure was placed on the National Register of Historic Places as an example of 19th-century rural vernacular church architecture. The first thing was a proper foundation, for which the commissioners approved $9,000 in 2012. On a bike ride Thursday I noticed that more improvements have followed. 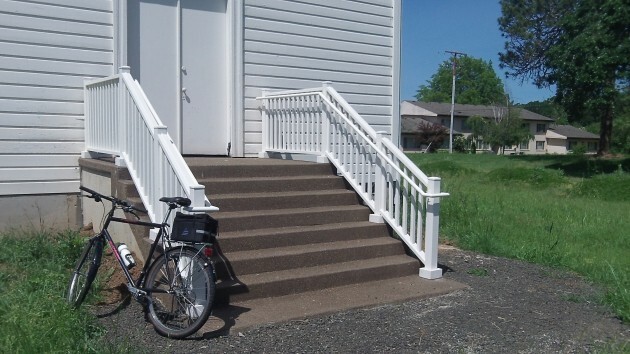 This year the church has been repainted and equipped with concrete stairs leading to the front door. And more work is coming, I learned Friday from Lisa de Graaf, the county’s parks operations coordinator. This summer all six windows will be restored by Chris Gustafson of Vintage Windows LLC of Albany. To protect the windows, new wooden shutters will be next. So far the county has spent about $40,000 on the project. Next year, the county hopes to receive grants allowing it to replace the roof and put in a new floor. The plans also call for improvements on the grounds including walkways, a place to park, and an external restroom. De Graaf says the county hopes to fix up the place so it can serve as a wedding chapel and a community gathering place. For a wedding, for instance, the ceremony would be in the church and the reception at the Officers Club next door. The new stairs caught my eye as I was passing by on a ride.